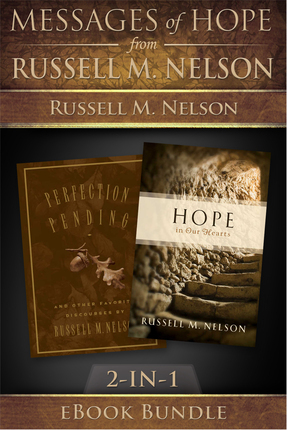 An admired and respected apostle, Elder Russell M. Nelson's book features a compilation of twenty-one talks from General Conference and BYU devotionals. 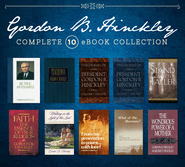 In one volume you'll read Elder Nelson's comments and counsel on such subjects as listening, making right choices, enduring to the end, applying the Atonement, and making covenants. With his positive attitude and customary wit, Elder Nelson gives us hope toward an eternal life with our Father in Heaven, if we will but endure. 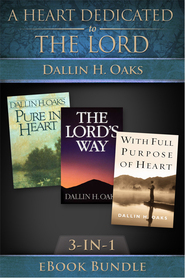 Perfection Pending will be a valuable addition to any Latter-day Saint's library. Few people understand the human heart better than Elder Russell M. Nelson, who, prior to his call into the Quorum of the Twelve Apostles, was a pioneering cardiac surgeon. Today, as an Apostle, he understands our hearts in a new way — most particularly, he understands our need for hope in our hearts. As a special witness of Jesus Christ, he testifies powerfully of where that hope can be found. In Hope in Our Hearts, Elder Nelson brings his remarkable grasp of the gospel and his unique medical training to bear in eighteen outstanding messages that focus on family and relationships, Church doctrine, and personal growth. 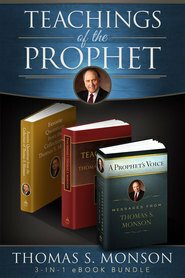 The book includes such classic addresses as: “Nurturing Marriage,” “Jesus Christ — The Master Healer,” and “The Magnificence of Man,” as well as some talks that aren’t widely available, such as “The Family: The Hope for the Future of Nations,” a landmark message given at the World Congress on Families V. An introduction written especially for this book includes important experiences, lessons, and photographs from his life. Russell M. Nelson was sustained as the seventeenth president of The Church of Jesus Christ of Latter-day Saints in January 2018 after serving in the Quorum of the Twelve Apostles for more than 30 years. Prior to his call as an Apostle, he was a world-renowned cardiovascular and thoracic surgeon, medical researcher, and educator. He received his BA and MD degrees from the University of Utah and a PhD from the University of Minnesota. He and his wife, the late Dantzel White Nelson, are the parents of ten children. She passed away in February 2005. President Nelson married Wendy L. Watson, a professor of marriage and family therapy in BYU's School of Family Life, in 2006.